You might’ve heard the word “Hikikomori” somewhere before. Literally, it means pulling away, being confined. It pretty much means “Anti-Social”. It’s been a social phenomenon in Japan in recent history and has been hitting other countries as well. The word has been used as English slang for a while now for those that are familiar with its meaning. It has been revealed that it is now a word on the Oxford Dictionary according to Oxford University Press, the dictionary’s publisher. Other words that have been included recently are “vuvuzela” (which I’m sure most of you guys have heard of during the world cup. ); “bromance,” a close but non sexual relationship between two men or more. “otaku” which loosely means nerd or geek in Japanese and “karoshi,” death from overworking. The Japanese language has been contributing to the English language as we know it for some time, although not as much as other western languages. The word Karaoke (literally “empty orchestra) is originally Japanese as well. The more you know! The anime on top is from N.H.K. ni youkoso (Welcome to the N.H.K.) It’s about a hikikomori boy and his life in a downward spiral until he meets a girl that tries to help him out of his hikikomori ways. I recommend any of you interested in the hikikomori phenomenon or just to have something fun to watch to check it out sometime! お笑い = (Owarai) = Comical story/skit. 大笑い = (Oowarai) = Great laughter or burst of laughter. The two words sound similar but this one has an extra “O”. 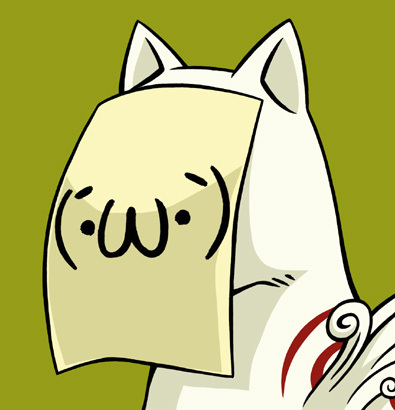 ｗ = lol (If you’ve ever wondered why you see random w’s at the end of Japanese sentences, it’s their version of lol. ワロタ = (Warota) = I laughed or lol’d, past tense. 天ぷら (The Kanji for “Ten” is the same as the word for Heaven, fits the dish perfectly) Tempura is a dish of deep fried goodness from Japan, usually made with seafood and vegetables. It is truly a food for the gods themselves. If you’re curious about the taste… Well, get the best day of your life and then put it in your mouth. It’s kind of like that. What makes tempura different from your average fried foods is how crisp and light the batter is and if you make it right it’s not as greasy as you’d expect. Do not get it confused with other fried foods, if there are any kind of breadcrumbs involved (or panko) it is considered a “furai” such as ebi-furai, tonkatsu, korroke (as you’ve seen in my previous post). Let’s start with the batter. This is a typical type of batter. If you want best results it would probably be best to go to your local asian grocery store and find yourself a pack of tempura batter. 2. Add Ice water to the bowl, make sure you don’t put in any ice cubes. The reason for using cold water is because it helps out the texture of the tempura. The colder the water is, the better. extra : Be sure not to over mix the batter too much. Don’t mind the lumps here and there as long as they’re not way too big. When it comes to ingredients there are many to chose from. Pretty much any kind of seafood or vegetable you can imagine. 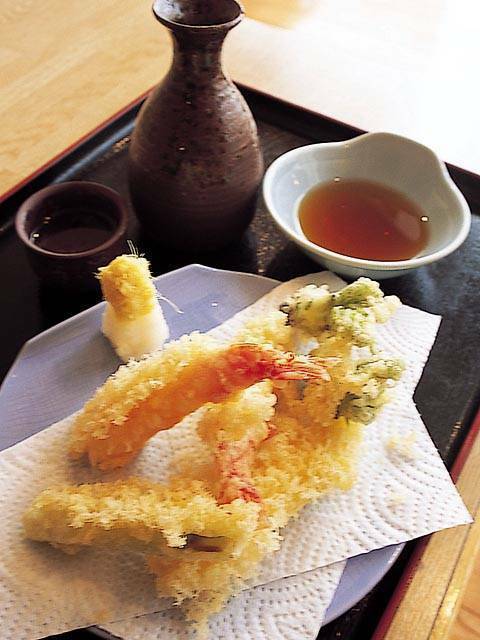 You can be creative and make your own original tempura! – Satsumaimo (Japanese Sweet Potato) I’m sure any kind of sweet potato would work too. 1. Let’s make sure we have everything prepared and cut (about 1 inch in thickness) before we prepare the batter. That way it stays as cool as possible. Either that or leave it in the fridge/freezer after you’re done making it and then cut the veggies. Do that if you really have to, it is usually recommended to not start with the batter. 3. Lightly dip ingredients in the batter and fry them until crisp. Good tempura will be a light golden color. Keep in mind once again, vegetables take longer to fry than seafood. 4. Drain tempura on a rack. If you don’t have one then use paper towels (you’ll need a good amount if you do it this way). 5. Enjoy eating your delicious tempura! Goes great with rice, soba (thin Japanese noodles served warm or cold depending on the season), udon (thicker noodles, usually served warm. Top a bowl of udon with tempura for awesomeness). – Fry the vegetables first, at maybe 340F then after that the seafood at 350F. – Oil Temperature is really important for tempura. Drop a little batter into the oil. If the batter comes up right away instead of sinking to the bottom of the pan, it’s about 360 F degree. If the batter goes halfway to the bottom and comes up, it’s about 340F degree. This is said to be the right temperature to fry tempura. – Try not covering the ingredients with way too much batter. – Be sure to pat down the seafood as much as you can to avoid any unwanted oil splashes. I tend to go with the tentsuyu whenever I make it. Goes great with any kind of tempura. You didn’t think I was going to leave you without teaching you how to make it right? 1. Boil 1 cup of water and add the dashi soup stock. 2. Add the mirin, soy sauce and sugar. 3. Let it boil for a bit but not too much, enough for the sugar to dissolve. Let it simmer and you’re set. Hope you enjoy making your tempura! It can be tedious work but the results are always worth it. Give it a shot! Ah, I almost forgot, here’s our lesson for this post! Possible new island in Japan? A coast guart patrol vessel detected an underwater volcanic eruption Wednesday morning in the Pacific Ocean close to Minami-Iwoto island in Ogasawaramura, Tokyo. Some Japanese Coast Guards based in Yokohama noticed some white smoke rising from the sea, about 5km northeast of the island. There has been speculation that the eruption could form a new island. It was the first time in about 5 years snce the last time any volcanic smoke had been detected in the area (about 1,200 km south of central Tokyo). According to the announcement, the volcano spewed ash and smoke about 100 meters into the air, and the surrounding sea area changed to a yellow-green color while other parts became a cloudy gray. The volcano, known as Fukutokuokanoba has erupted seven times since 1904 when its activites were first recorded. On three occasions, land masses were formed, but all later sank below the waterline. Now wouldn’t that be something if it ends up being some sort of new island? Of course even if it does, it wouldn’t be able to support any civilization on it but who knows, maybe after a couple decades, centuries or so. 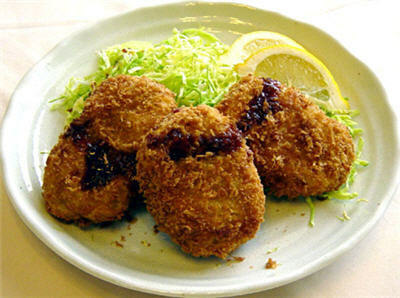 コロッケ　(Korokke) is the Japanese word for their variation of the French dish “Croquette”. For those of you that don’t know what that is, it’s pretty much a fried roll of goodness. They usually have mashed potatoes and some kind of minced meat mixed in it. There are other variations of “Korokke” that uses a white cream instead of potatoes, called クリームコロッケ (Cream Korokke) but today we’ll take a little look at how to make the potato version. Korokke can be eaten as a snack or part of a meal, it can be put between bread and some veggies to make a nice sandwich as well. – Enough oil for deep frying. Condiments : Bulldog sauce, similar to Worcestershire sauce but a bit sweeter, can also be found at your local asian grocery store. Ketchup is fine too. 1. Peel potatoes and cook in water until done. Test with bamboo skewer, fork or knife to make sure it’s soft enough to mash. 2. Heat 2 Tbsp oil; add chopped onion and saute until transparent. Add ground chicken and cook until done. Season with salt and pepper. 3. Mash cooked potatoes; mix with cooked chicken. 4. Divide into fourths. Make 4 patties. 5. Coat the patties with flour, beaten egg then bread crumbs. Deep-fry in oil, 340°F~360°F (170°C~180°C), until golden brown. Anyways I hope you’ll enjoy this great dish! I’ll be posting random recipes when I can since I’ve been getting good feed back from you guys for my food related posts, so stay tuned for more! There you have it, until next time! 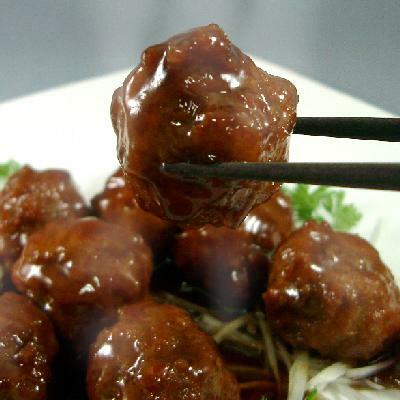 It’s really simple to make, all you need is some cornstarch, soy sauce, sugar and water. Yeah, that’s all. I like mine a bit on the sweeter side but people from Japan have different ways of making it. Some like theirs a bit more on the saltier side and some more on the sweeter side. You can pretty much add soy sauce/sugar to your own discretion. Start out by warming up 1 cup of water in a sauce pan in about medium-high heat. At this point you can add a little fish stock or “Dashi” (You can probably find em at your local Asian grocery store) but it’s fine without it too. Then Here’s the part where you can do it how you like. I usually add about 4 Tbsp of sugar and 2 of soy sauce. Then let it boil until all the sugar dissolves. Next is to make it into a nice and thick sauce. In a small seperate container. Once the cornstarch is mixed into the water well enough, toss it in the boiling sauce. The reason it’s better to use cold water is because the cornstarch mixes better in colder water. If you put it directly in the sauce, it becomes clumpy and almost like a dumpling like texture which isn’t that great for a nice sauce. Once you add in the cornstarch mixture, you want to make sure you mix it well. After a few minutes or so, you should be able to notice the sauce getting thicker and bubbling a lot. At this point, put the heat down to the lowest number. When it’s not as hot, you can taste the sauce off the spoon and add more sugar or soy sauce to balance it off to the way you like it. If the flavor is too strong at this point, just add some more water to it. If the sauce becomes too watery then just make some more cornstarch mixture until you get it to the texture you want it to be. You can also add some Sake or Mirin to change the flavor up to your liking. What’s great about this Teriyaki sauce is not only the great taste but the versatility of it. You can use it as a marinade or put it on a simple burger to make it into a delicious Teriyaki Burger. The sauce goes great with any kind of BBQ as well. Get some chicken and put them on skewers, marinade it with the Teriyaki sauce and voila, you got yourself some nice “Yakitori”. That’s about it, there are many more uses for this sauce that I haven’t mentioned but it’s up to you to explore your own taste! It’s a commonly used word for many Japanese dishes. That about covers today’s lesson. Stay tuned for more! Koichi Kawato is the new Japanese Literature teacher at the ill-famed Futakotamagawa high school, whose baseball club is composed of thugs and bullies who have been suspended for a year from all school competitions, for causing a brawl during an official match. The newly appointed teacher finds that the club members left are only interested in women, smoking and doing nothing until, under Kawato’s guidance, they discover their dream of going to the Koshien high school baseball tournament. However, the road to Koshien is far from easy as many obstacles await them. Those are the words for now~ I hope those of you that get a chance to catch the series enjoy it just as much as I did! 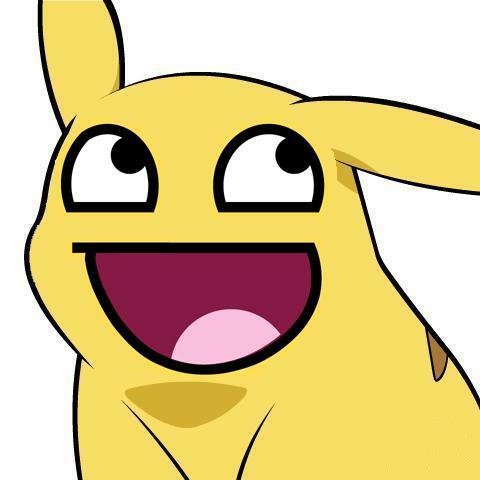 Since the pic for the post is one of an awesome smiley pikachu, today’s brief lesson will be on Japanese wordplay! As some of you know, “Pokemon” is short for “Pocket Monsters”. The Japanese have always had a way of getting two word phrases and making it into one by getting the first couple letters of the two words and combining them together. For example, in Japan a lot of the younger people would call “Harry Potter” something like “Haripo”. Brad Pitt become “BuraPi”. “Dragon Quest” to “Dora-Kue” and so on, you get the idea. So if you ever hear anything in Japanese sound a bit weird when then chances are, it’s some sort of slang or word play that modified the original meaning of it. This one is for the gamers out there. For those of you that don’t know about the Tokyo Game Show or TGS, it’s pretty much the Japanese version of the E3 (Electronic Entertainment Expo) we have here every summer. This year’s TGS was quite eventful, especially if you’re more into RPG’s and what not. Square Enix made a bunch of announcements on upcoming games, from Kingdom Hearts “Birth By Sleep” to two mobile phone Kingdom Hearts titles that will be released exclusively to the superior Japanese cellphones that will probably never see a day of light over here (If we do then hurray for us! ), more on FFXIII due to come out this Christmas holiday in Japan and spring of 2010 over here in the States and Europe and also PSP’s FFXIII Agito. Speaking of PSP’s, they announced a price drop of 15% on the PSP 3000 models. It’s going to be around 16,500yen so that’ll roughly be about $180 dollars here. So if you were planning on buying a PSP anytime soon, stop right there and wait a little! On the side note, Nintendo also announced that they will be cutting down prices on Wii consoles from 25,000yen to 20,000. It should be dropping its price down to $199 here in the states this coming Sunday. I will teach you how to count to Ten thousand in Japanese. It’s pretty simple, you just have to remember the exceptions and you’re set. Here are a few exceptions! This is pretty much what a typical Japanese breakfast would look like. There’s usually a bowl of rice, miso soup and some fish along with some other extras. Yes, we eat those for practically every meal and it never gets old. Although we do like to change things up a bit and have a bit more of a western type breakfast such as your usual eggs, toast and sausage/bacon. Such as this one right here! For today’s lesson, we’ll be looking at common greatings and good byes. こんにちは。 – Konnichi wa. – Good afternoon. こんばんは。 – Konban wa. – Good evening. さようなら。 – Sayounara – Goodbye. おやすみなさい。 – Oyasuminasai – Good night. and that about covers our little lesson on greetings for today!